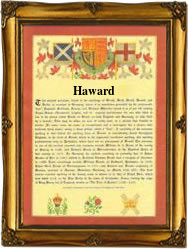 Recorded in the spellings of Hayward, Haward, and Heyward, this is an English surname. It originates from the pre 7th Century words "hege" meaning hedge or fence, plus "weard", a watch or guardian. It was an occupational status surname for a person employed on an estate or settlement, to check and arrange the repair of all the fences and walls, to prevent unauthorised access to the royal hunting parks by poachers, and to deter cattle from breaking through into the arable lands and destroying crops. The surname is first recorded in the latter half of the 11th Century (see below), and other early examples include: Richard Haiward, who is recorded in the 1166 Pipe Rolls of Norfolk, and Alicia le Heyward, which is an interesting example of early job parity, who appears in the Hundred Rolls of Huntingdonshire, dated 1273. In 1379, Robertus Hayward was recorded in the Poll Tax Returns of Yorkshire. It is interesting to note that in mid 17th Century Records of Norfolk and other records thereafter, the name is synonymous with Howard - William Heyward or Howard, Sheriff of Norwich (1657), and Edward Howard or Heyward (1663), donor of three pounds per annum to St. Swithin's Church, Norwich. The first recorded spelling of the family name is shown to be that of Godric Heiuuard, which was dated circa 1095, in the registers of the abbey of Bury St. Edmunds, Suffolk. This was during the reign of King William 11 of England, 1087 - 1100. Surnames became necessary when governments introduced personal taxation. In England this was sometimes known as Poll Tax. Throughout the centuries, surnames in every country have continued to "develop" often leading to astonishing variants of the original spelling.